Offline : Noida Stadium, Contact no. 9650524555/9650574555, Email: dancingmantras@gmail.com. 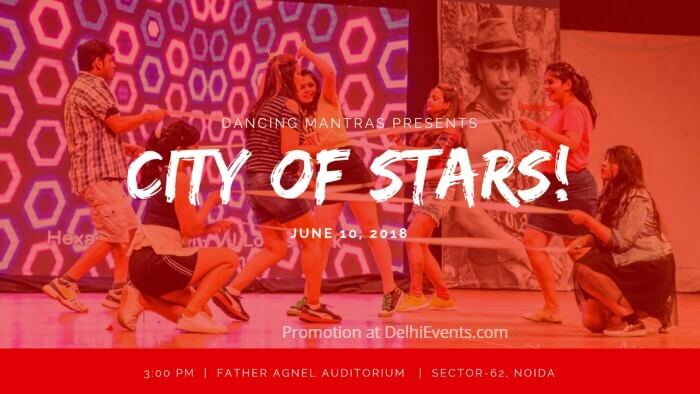 Event Description : DANCE "City of Stars"
City of Stars - 2018 is Noida's biggest Bollywood dance extravaganza! A show full of power packed performances filled with skills, energy, music, production, choreography, and costumes that have mesmerized audiences in the past. Experience a true blend of various styles and grace of Bollywood where the Company dancers, Instructors, and students will come together once again to display their passion and love for dance. A one-of-a-kind platform that showcases 120+ performers in a three-hour action-packed show this summer, with a total audience capacity of 500! Unmatched magic, quality, an artistic and creative direction under one roof and on one stage. We redefine "Bollywood" by encompassing various dance genres like Modern Dance, Jazz, Hip Hop, Salsa in addition to the Zumba form. The company is into providing the best of Bollywood style dance classes through its Director and elite team of Instructors. Nishant,the director of academy, has 12+ yrs of experience in performing arts and specializes in Bollywood. In the past he has assisted Shiamak Davar as an Instructor in SDIPA for 7 years. Also, he has performed with Bollywood stars such as Shahrukh Khan, Salman Khan, Amitabh Bachchan, Ganesh Acharya and others. Presently the lead actor in the -'Bollywood Love Story - A Musical' by Teamwork Arts, he has also featured on media channels like NDTV good times, News Nation, DD National, Dainik Bhaskar & Navbharat times newspaper. We offer Bollywood dance classes in Delhi NCR, taught by a dynamic group of trained & seasoned instructors. The company is renowned for its amazing quality of instruction, choreography, song selection and the annual student dance showcase, which is a grand celebration of its student talent! Mantras Workout®, our dance-based fitness program is available to anyone looking to learn a cutting-edge Bollywood workout.